Loving cats may not make a person a liberal, but it does increase the odds that a person already is one. To see how accurate our survey was, we analyzed the data from 220,192 TIME readers who took the quiz and then volunteered their actual political preferences, and found that all 12 items did in fact predict partisanship correctly. Even seemingly innocuous questions like ones about the state of one’s desk or preference for fusion cuisine had at least modest predictive power. A majority of TIME readers, like a majority of Americans, prefer dogs to cats, but conservatives had a significantly stronger preference, on average. When you add together a bunch of these modest predictors, you end up with a pretty good guess as to how a person votes. 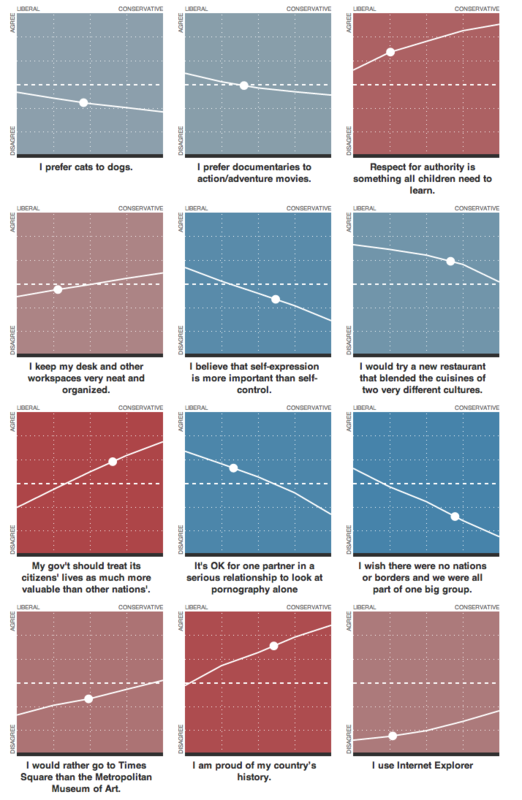 Not as good as asking people about their views on taxes, abortion and gun control, but enough to show that partisanship nowadays correlates with many non-political attitudes and behaviors. Interestingly, Libertarians—often considered as being on the political right—fell between the liberal and conservative extremes on most questions. Even when it came to an affinity for nature’s truest libertarians: felines.